Hello everyone! See you again in Ada Indonesia. Apa kabar semua? Have you try the recipes that we posted here? If you already tried, we love to see the pictures of it. You can post the pictures in our Facebook or tag us on Instagram. And if you have any doubt or difficulties, do not hesitate to ask us. We will try to help you and give you a solution. Today we want to share a recipe from Thailand. 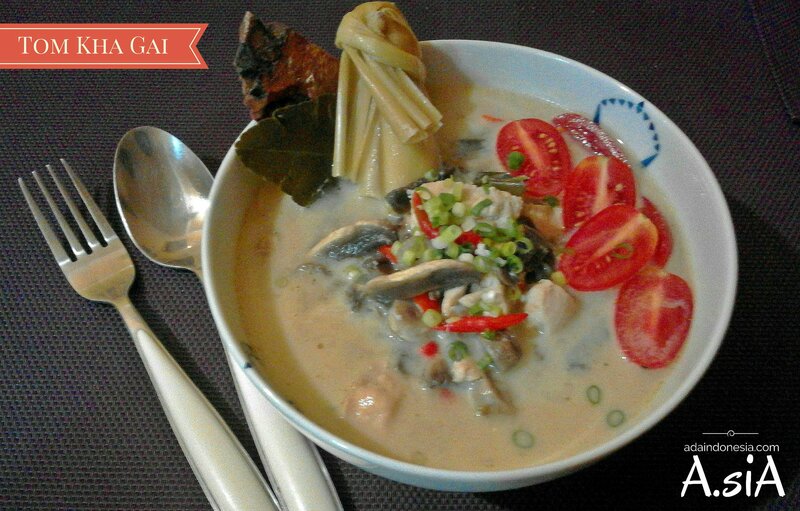 The name of this recipe is “Tom Kha Gai”. I know that you already know Tom Yum Goong. This is another soup version that also famous in Thailand, but instead of seafood, we use chicken in this recipe. The flavor of this soup is also refreshing like Tom Yum Goong. So, without any further explanation, let’s go to the kitchen! Put chicken stock in a pot, and bring to a boil. Add lemongrass, galangal, kaffir lime leaves, and chilies. Simmer for 15 minutes to infused the stock. After that add chicken, coconut milk, fish sauce, salt and sugar. Cook for 3 minutes, then add mushroom. When the chicken and mushroom are cooked, adjust the taste and turn off the heat and add lime juice. Garnish with chopped spring onion and tomato cherries. Serve it hot with hot steam rice. If you don’t have fresh coconut milk, you can use coconut cream powder. Just mix 4 tbsp coconut cream powder with 1 cup of water.Thank you for visiting our website. We love to hear from you, so please leave your comment down bellow. Don’t forget to like us on Facebook and follow us on Instagram, or Google+, and subscribe to our channel in YouTube A.siaVlog so you will receive a notification of our new post. If you want to share any good recipe or information, do not hesitate to write to us. We will publish it on behalf of your name. Hope you like this recipe, and take care! We’ll see you again in our next post. Tetap di Ada Indonesia…see you soon!